She joined the Faculty of Medicine of the University of Lisbon when she was just 16 years old. Despite ending the year as a 17-year-old, she was certainly one of the youngest students to enter until now. She argues that at such an early age you have few convictions about what you want to be, but since she was a 20-mark student in Physics and Maths at secondary school, she knew that it would not be difficult to choose the toughest of courses. Maybe it was the first time that Cardiologist Ana G. Almeida broke someone’s heart, the same as saying that she did it to her Mathematics teachers, who even appealed to her parents to convince her to enter the world of numbers, since her head was tailor-made for such reasoning. But her parents respected her path since she showed that she never erred from it, and supported her, whatever the decision. She took piano lessons at the Conservatory, left at fifteen, yet learned the art of music for five years. At home she has a grand piano where she plays “little pieces” and, before she knows it, three hours have already gone by. Music could have been another of her professional alternatives, “if I was born with a gift, it was music”. But even the aptitude, so praised by her teachers, never gave her a prospect for the future. Medicine was a very complete and integrative area, and even though it had a familiar aspect of science, what moved her was the human aspect, and the prospect of being able to change the lives of others. Perhaps because excellence always requires a sum of wisely combined parts, she also knew that she had to research, because a good doctor cannot go without research, and a researcher is not complete if they are also not a doctor. She dreamt of flying to another country to graduate, but ended up staying, because times were different and because she believed she should invest in her own country. While saying she had the ideal teachers, but in an attempt to anticipate that she would tell us about someone in Cardiology, she explained that Psychiatry was one of the areas that made her heart beat. “Professor Bracinha Vieira was Assistant in my time and we went after him everywhere, because he was fascinating, he wasn’t just a Psychiatrist, he was an incredible connoisseur in Anthropology and Philosophy and we could discuss this and many other subjects with him; once the classes were over, we would go with him to do consultations. At that time, and due to our age, we raised a lot of existential issues, and he stimulated us immensely in that sort of discussion”. Professor David Ferreira in Histology also impacted her journey. Although she was setting goals, chance and coincidence eventually pushed her to Cardiology. An excellent student, she almost always got high marks in the basic sciences. Even though she looked at the clinical aspect with admiration, she had never even thought about Cardiology, it was lab work and research that seemed to be her purpose in life. She had met Professors Fernando Pádua and José Pereira Miguel, who back then was responsible for the Centre for Preventative Cardiology and a person she describes as “exciting” and ended up participating, as a 4th-year student, in several screening activities with him. It was at the end of her general internship and while she was preparing to take the specialty exam – when she was taking break of a few months waiting for it – that she was placed, without being given a choice, in the Cardiology Department. “At that point, when I received the news about my placement, I hated it, I was very angry and I even tried to talk with Professor Pádua to change it, but I was unsuccessful, I was the only intern that stayed there”. But it was in the unsuccessfulness of her desire that she met “her new world, which overwhelmed her”. That was how chance came to make sense, after the first month of denial had passed. Today she is Coordinator of the Santa Maria Cardiology Techniques Unit, an area which she thought “didn’t make much sense”, but it was precisely there that she stayed to work. She is also in charge of Cardiovascular Imaging at the same hospital in the context of the Unit and Scientific Secretary of the Cardiovascular Centre of the University of Lisbon (CCUL). Echocardiographies and cardiac catherizations were exams where she began learning as an intern; she also had access to cardiac interventions and realised that the more she knew, the more she wanted to study. She took the specialty exam in which she had the fourth best grade, and this made her choose Cardiology at the Santa Maria Hospital. As soon as she finished her five year specialty, Professor Pereira Miguel invited her to develop a new Cardiology Technique. At the time, Pereira Miguel was the Director of another hospital in Lisbon and invited Ana G. Almeida to develop techniques within a new area – Magnetic Resonance. She needed to specialise in this area and went to Dallas, USA, where she stayed several months for an internship. She later moved to London, where she trained for six months. She has returned to London many times. Despite having embarked on an unplanned journey she initially didn’t accept, she became the first person to perform Cardiac Magnetic Resonance in Portugal. It has only been twenty-two years since Resonances started being performed in Portugal. At the moment, she is a member of the European Cardiology Society where, in partnership with another colleague, she is responsible for certifying doctors who practice Cardiac Magnetic Resonance. She regularly travels to London, to follow their evolution and to prepare their certification. She loves to read and learn about History, so it’s not a coincidence that she also teaches History of Medicine at the Faculty, where she is Associate Professor of Cardiology with Aggregation. She began by teaching Anatomy as a 2nd-year student, then moved on to Histology, and since then she never stopped teaching and is also involved in several postgraduate courses. She supervises PhD and Master’s students, plus two or three with research projects every year, but never more than that, as she understands that to be a good supervisor, one cannot be supervising too many projects at the same time. She always keep some sort of connection to them and maintains contact with the foreign students, also thanks to the international projects in which she participates. If she had to play a composition to describe who she is, she would play a Mozart sonata but, in fact, her heart is also divided between Beethoven and Wagner. “Mozart demands absolute perfection, it is not at all easy to play”, but the fact is that we know that she plays as if her hobby was her profession. Mornings are always busy among patients waiting for their turn and small groups of students joining in to do internships within the course. Another 22 third-year student have just joined in; they are curious about Cardiology and this is the first contact they have with patients. That is a magic moment for them. 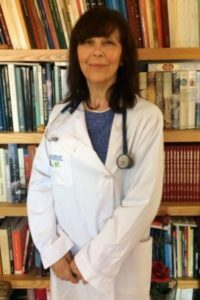 Ana G. Almeida knows it and knows the life of a doctor is very demanding, both physically and psychologically; it is an emotional challenge that you can only overcome by being passionate about everything you do. She tries to pass these emotions on to her new followers, she says “that passion has a very integrative effect, because it deals with the human being as a whole and knows that it can do good and take away suffering; this is something that is highly rewarding”. Recalling her student years once again, she explains that one of the great differences between the past and now is that there was no access to professors or to patients like there is today. On the way, however, there are mainly bureaucratic obstacles that sometimes hinder the interaction between doctors and patients, due to the degree of demand of everything that involves their treatment; complex computer issues and all questions related to organisation are some examples of this. By vote of confidence of her personal friend and Director of the Faculty, Professor Fausto Pinto, she is responsible for the organisation of distribution of 3rd-year students and, because she is teaching Introduction to Clinic, which includes a five-week long internship, she knows her students will be 100% focussed. That requires her to be as committed as they are. As I waited for the Professor, I saw a group of anxious students waiting for her, ready to start the day. They don’t seem to be in a hospital surrounded by patients. But this is what moves them and what moved her. Ana Almeida: They love being here, it is a breeding ground and, if they are stimulated, they give their best. For us doctors, monitoring is not simple either, because we have to see and assist the patients and it is difficult to guide these groups of young people who have a thirst for knowledge, asking questions and using techniques. They start doing clinical stories in the 3rd year, so it’s a very interesting phase for them, they spend a good part of the day with us. They were supposed to be with us only in the morning, but they like it so much that they spend their days here and they even monitor the emergency room. There is a tutor for every two students, which means that the interaction between them often lasts well into the future. When they decide to take a Master’s degree or a PhD they come and talk to me and ask for advice and guidance. On the other hand, I have had groups that were so close to the patients they knew that they actually accompanied them throughout the process, visiting them after the surgeries, staying in the hospital after hours and coming back on weekends specifically to follow them. Does the time teach them that it is necessary to keep some distance from the patients? Ana Almeida: This situation is somewhat limited in time for them, it’s six intensive weeks. But then we must bear in mind that we have the right to our time and to our rest and leisure; that is the only way to be more effective with the patients. That time is often used to study. You know that, in Portugal, unlike other countries, study is not included in our work schedule. We all have to study hard and do a lot of work at home. A Professor’s timetable includes some time for preparing classes, but a doctor’s doesn’t. A doctor has clinical sessions and preparation sessions, but they are always integrated into the care activity. The same applies to research, a doctor doesn’t have time specifically allocated to preparation and research. This is an issue that has been discussed for a long time, but nothing has changed. All in all, the fact is that doctors have to split their time into a wide range of activities and sometimes it is difficult to coordinate care, teaching and research activities. Is it true that there is a parameterisation of the consultation time for each patient? Ana Almeida: There is a parameterisation, yes. In Cardiology we have twenty minutes, but we have to take into account that the physical examination takes time and that often the first consultation takes longer, because patients already have a history and very extensive files, some with very old and complex data. So the first appointment can easily take 45 minutes. But what entity imposes these times? Is it the National Health Service, is it the Hospital? Here in our hospital (Santa Maria) we are fortunate to have offices dedicated solely to Cardiology which allows us greater availability of time. The multidisciplinary ambulatory sector of the Hospital has tight limits on consultation times, which means that, after three hours, a team, or a doctor, needs to leave to make room for others. This rotation creates a pressure that shows that we have to go right to the point and manage the problem as best as possible. With regard to cardiac exams, we receive requests from the entire hospital asks, even from areas that are not directly related to Cardiology because half the patients we receive are referrals from other doctors dealing with other pathologies. We have a lot of pressure because cardiology can’t wait, the information is needed immediately so we can be able to treat the patients. We are the unit that performs more Echocardiography exams in Portugal, but we always have waiting lists, because this information is crucial. We should have more resources, but we should also streamline the use of these exams. Ana Almeida: The National Health Service (SNS) should have paid attention to this part, but as it has been reported, we know that there is a great shortage in human resources. There is a shortage of doctors in all specialties. And the doctors here have to do the same work as if they were many, and sometimes in less time because they are highly demanded. But, you know, I believe that this reality can change, it is just a question of weighing the needs and actually meeting them. Are you an optimist who believes that change can happen, even in a system like the SNS? Ana Almeida: I believe so. Because I’m an advocate of the SNS. I think our public health service is excellent, much better than the English one, which is so often considered a benchmark for everyone. I know the English National Health Service rather well and it is excellent when it comes to highly differentiated institutions. If you need differentiated care, like intensive care, or advanced surgeries, then they are great and have excellent research. But if we talk about the English service in terms of primary care, or less serious situations, care and availability are much worse. At the moment, England is also very plagued by financial issues, so they have to ask for fewer exams, fewer interventions and gaining access to a specialist can be very difficult. In my opinion, our SNS (NHS) is safer and more robust, and it allows for this variety of examinations and appropriate treatments supported by the State. While, in England, the great medical centres are virtually all located in London, here in Portugal we have several cities around the country where it is possible to perform important exams such as catheterisations, oncological treatments, among others. That makes me wonder whether a doctor should always have be “smart” enough to realise what is truly essential right from the start, thus becoming more profitable. Ana Almeida: That question is very interesting because it touches on a subject that is being highly debated nowadays, which is artificial intelligence and how it can change Medicine. It will surely influence medical practice. When we collect patient data, be it symptoms, be it signs, we are playing with learning and all our experience, but we can catch subtle signals that a computer is not able to identify. Computers would need numerous correct elements plus so much subjective data to be able to explain what is wrong, and computers are not able to do that. This makes us realise the importance of the human doctor/patient relationship, because it supports the diagnosis, and that the subtle signs that lead to a decision and a treatment are also identified at this stage. At that point nothing is mathematical, nor an exact science, because there is a lot of subjectivity. I would say that it really takes a degree of art and, of course, knowledge, considering all the lessons learned, but also intuition. How did you deal with being the first person to implement a new technique (magnetic resonance imaging) in the country? Did that scare you? Ana Almeida: I am a person that has courage in the face of novelty, many told me that I was being bold, to start a thing of this magnitude alone, but I was supported by the centres where I worked and London would give me all the support and help if I needed it. It was a truly fascinating challenge, I loved this technique. This forced me to take options, because I stopped doing haemodynamics (exam that analyses, and nowadays treats clogged arteries); in fact, I stopped using invasive techniques. I couldn’t do everything at the same time. I focused specifically on non-invasive imaging techniques, namely Resonance and Echocardiography and, more recently, CT coronary angiography. These techniques have witnessed a massive growth and are key to diagnosis in Cardiology. We are talking about non-invasive techniques which are also less aggressive, but there are some that do imply a dose of radiation. Does this radiation cause medium-term damage to the heart? Ana Almeida: A non-invasive technique does not shed blood, but it involves radiation and this radiation is cumulative throughout life and the studies suggesting a possible risk of cancer increase, yes. These non-invasive tests should be used occasionally and not repeatedly, unless there is no other option, and if there is another option, they should not come first. CT is becoming increasingly common because it is using less and less radiation, but it will always have radiation. It has excellent applications, but it can’t be performed every month, that is, it can’t be used to follow patients systematically, unless we are talking about tumours or neoplasias (uncontrolled cell proliferation) which require frequent examinations where the risk of the disease outweighs the risk of radiation. In general, we should always use alternatives where radiation is not the first choice, such as ultrasonography or magnetic resonance imaging, in the case of imaging techniques. As someone who deals with cardiac imaging, what subliminal messages can you find while “photographing” the heart? Ana Almeida: Such as in other areas, imaging is at the top of the list when it comes to diagnostics. Nowadays it is very difficult to diagnose a patient without resorting to cardiac imaging. Cardiac imaging is anything but a photograph, the image has movement, contrast, it offers an in-depth perspectives on how the heart is functioning. Imaging includes Echocardiography, Cardiac Magnetic Resonance, Cardiac CT and Nuclear Cardiology. Imaging gives us the diagnosis and the prognosis for heart patients. For example, Resonance enables us to study the heart muscle and understand how the heart may be affected by diseases such as myocardiopathies or myocardial infarction. Imaging is such a great help when it comes to characterising some diseases that we can avoid biopsies. It gives us so many indexes that it allows us to make appropriate treatment decisions and, ultimately, enable a patient to live longer. Imaging is widely used to deal with arrhythmias, valvular heart disease, coronary disease, heart failure. But it’s one of the major causes of expenditure in healthcare. Imaging costs are higher than a lot of other costs, because it’s often used for screening and prevention. Nowadays, the great challenge is how to contain those costs, because we have to rationalise the use and choice of imaging for diagnosis and follow-up and we can’t ask for too many exams. Your personal and academic profile shows us that you have a very accurate sense of perfection. Are you always looking for the perfect student? Ana Almeida: I demand a lot from myself and therefore from others. Sometimes I have difficulties in finishing papers, or other tasks, because I want everything to go so well that it never seems perfect. But nothing is absolutely perfect, otherwise there would never be an end. This means that I expect this perfection from others, but time has taught me that we must slow down and realise that speeds are different and experiences as well, but we should always de demanding. Now that you look back at the setbacks you were faced with and which pushed you to a path you wouldn’t have chosen, do you think that in the end, it all made sense? Ana Almeida: It did. Even though I believe that we are ultimately responsible for our choices, I don’t think that our fate is predetermined, there are things that happen to us in our lives and ultimately change us. If I could go back in time, I might spend a few years out of the country, but at the time, I made my choice and one of the main reasons was that I wanted to invest in our country. Anyway I did internships abroad, in top-notch centres and with leading professionals, in addition to maintaining numerous contacts for research and work. The Santa Maria Cardiovascular Imaging Unit she coordinates is a national benchmark and has all the conditions to keep on growing. For the first time, as National Coordinator of the Nuclear Cardiology, Magnetic Resonance and Cardiac CT Study Group of the Portuguese Cardiology Society, she organised the 1st Iberian Meeting about advanced cardiac imaging, with special emphasis on the European Society of Cardiology; it was so successful that several countries are now applying to join. Next year, Ana G. Almeida will co-organise the European Congress of Cardiovascular Magnetic Resonance, in Venice. When it began, the Congress brought together a “small family of 100”; today it has grown to 1500 and promises to continue to break down barriers. Used to perfection and a natural-born optimist, Ana G. Almeida always believes in the growth of projects and people and is fully committed to her convictions. The truth is that, despite the passing of time, she continues to look at Medicine with the fascination of a newly arrived student.